My name is Pamela Elder. I was born in Hartlepool on the 15th November 1945. My mother was a housewife and my father trained as a cobbler, this was in the time of the Great Depression, but he never actually worked as a cobbler. During the war my father worked at the steel works. He didn’t join the army because he was considered to be a necessary worker (the country needed steel as part of the war campaign). For my primary education I just went to the nearest school to our house. For my secondary education I was meant to go the nearest school, but as it didn’t have a very good reputation, therefore my mother insisted that I go to a grammar school and do my GCSE’s there. I always wanted to be a nurse, so once I finished my secondary education I went to the hospital to work as a caudate. So as a caudate you have to work for about two years before you could actually go into training to become a nurse. I wasn’t personally a person who went out a lot. Every now and then I used to go out with some of my friends, but that was about it. Before my conversion to Islam, Ahmadiyyat I did know a little bit about Islam. This was because at the hospital I used to work with a lot of the doctors that were Muslims, but I didn’t know anything about Ahmadiyyat. It was one of the doctors at the Hospital that I worked with that led me to Islam, Ahmadiyyat. I used to see him and his wife driving up and down the drive way because they lived in the flat above to where I worked and his wife was always dressed in her traditional outfit. I remember it was Christmas and I took some presents for them because I knew that they had little children and after that, his wife kept inviting me to their house. This couple were called Dr Hameed Khan and his wife Mrs Sajida Khan. Eventually I started to babysit their kids, but it wasn’t till after a few years that we started to speak about religion. It was Mrs Khan who bought up the topic of religion. I used to take the Bible to their house and Mrs Khan had the Holy Qur’an and we used to exchange references. During this process I was blessed to be able to meet Chaudhry Zafarullah Khan Sb. Chaudhry Sahib had such a personality that if you met him it was impossible to not believe in what he said; maybe this was due to the fact that he was a companion of the Promised Messiah, peace be upon him. Mrs Khan used to hold meetings in her house for the reason of Tabligh and when Chaudhry Sahib came I had the opportunity to meet him separately and it was just really hard not believe in what he was saying, because he was such a pious man and whatever he said, he said with such conviction. It was after this meeting that I took the Bai’at. I went to some Jalsas and even had the good fortune of travelling to Pakistan. I really mixed well with the Community. But most of all it was the example of Dr and Mrs Khan that made me want to believe and convert because they preached what they believed and they believed in what they preached. Before my conversion I read some literature such as the book by Chaudhry Zafarullah Khan Sahib ‘Deliverance from the Cross‘ and Mrs Khan gave me various other books that I read over the period of a few years, before I decided to convert. I can’t emphasize on the fact that a lot was by their example that made me want to convert to Islam, Ahmadiyyat because they lived their religion. I know that in Mr Khan’s life, the most important thing to him was God and he would never do anything wrong, because he knew that God was watching over him. When I converted to Islam one of the things that came across as a challenge to me was that I was scared of how my mother would react to my conversion to Islam. I didn’t change my name because I knew that would hurt my mother. Although I was given the Islamic name Toobah. The missionary at the time told me that the name wasn’t the important thing, it was the faith that was important, that was very comforting. My mother was never against Islam because she knew Mr Khan personally and she knew that he was a different and pious person. My mother was never anti-Islam, she used to even come along with me to Mr Khan’s house for the meetings that used to be held there. We tried our best to try to convert her as well, but she used to say that ‘I am too set in my ways now and I can’t just change my faith over night and if I were to change I would want to do it to the best of my ability’. My mother deep down believed, but because she thought that she had reached an age where it was hard for to change her belief, therefore she didn’t. There was never a problem as such with my mother or my relatives regarding my conversion, the only thing was that they knew I wouldn’t drink any alcohol or eat any pork, so they never offered it to me, other than that, there was never an issue. The difference I felt after my conversion was that I felt more at peace with myself and I had a faith that I could say was mine. Because before I converted to Islam, I had never understood the concept of the Trinity properly and I was always told that you have to just ‘believe’, but with Islam all my questions were answered. Islam always proved itself to be logical to me. My relationship with God is much better now because obviously I pray more, and the more you pray, the closer you tend to get to God and the closer you feel yourself to God. I have also met the third and fourth Khalifas, may Allah have mercy on them. Because the third Khalifa was married to Dr Khan’s sister, so he came to their house and it was then that I had the pleasure of meeting him. At the time, the fourth Khalifa hadn’t become the Khalifa, so he also came to Hartlepool with the third Khalifa, it was actually him who showed me how to pray. I have also had the pleasure of going to Pakistan. The first time I went to Pakistan was for a wedding, this was before I had converted. At the time there was also a Jalsa Salana that I had the pleasure of attending. That experience was really good because you felt the love that people showed you and made you feel so welcome and made you feel that you are a part of them as a family; and it wasn’t just a few people, but rather it was the whole town. Another time I went to Pakistan was after my conversion, the purpose for that trip was to attend the Jalsa in Pakistan. 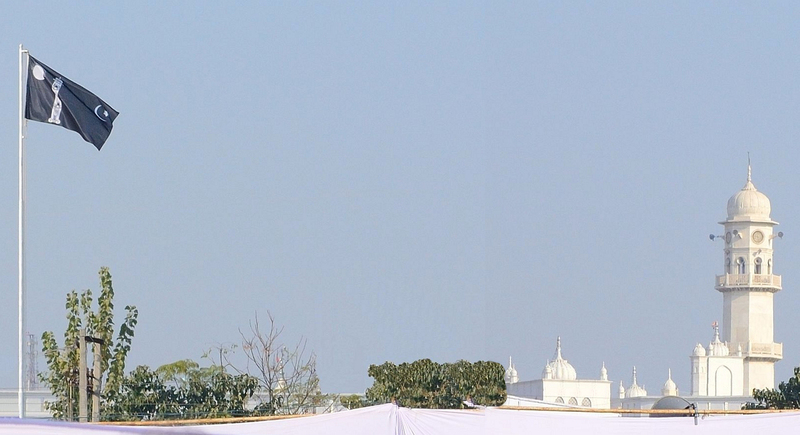 I have also been to Qadian, India. I had the pleasure of visiting the grave of the Promised Messiah, peace be upon him. I felt that it wasn’t just Pakistan or India or England that the people would behave nice to me, but it was wherever you went, you felt as if the community just accepted you as your own and there was never this feeling that they haven’t accepted me. So this was one of the things that really attracted me to Islam, Ahmadiyyat and made me want to be a part of this community and the reason for this behaviour was obviously because they all tried their best to live pious lives and follow the footsteps of the Holy Prophet, peace and blessings of Allah be upon him, to the best of their abilities. Being the first convert in the Hartlepool Jama’at, I felt that the thing that attracted everybody in the Hartlepool Jama’at to Islam, Ahmadiyyat, was the characteristics of Dr and Mrs Khan. They were just such pious people and if you got to know them personally, you would automatically want to be with them and believe in what they believe in, because you would know that it was the truth through their character. Ms Pam Elders is a very dedicated Ahmadi that was the first British convert in Hartlepool and is still living in Hartlepool and tries to serve the Jama’at to the best of her abilities.